SMDC, one of the largest and most trusted real estate development firms in the country, opened its first condominium project in Davao City with Lane Residences, a mid-rise building development that offers ease of access to every need as well as the luxury of owning an address in the city’s premier real estate district. Lane Residences is a reflection of SMDC’s aim of bringing Filipinos’ dream of luxury living. For SMDC, convenience is always a top priority, and this can be seen in the company’s building-integrated properties that are within reach of malls and other commercial areas. 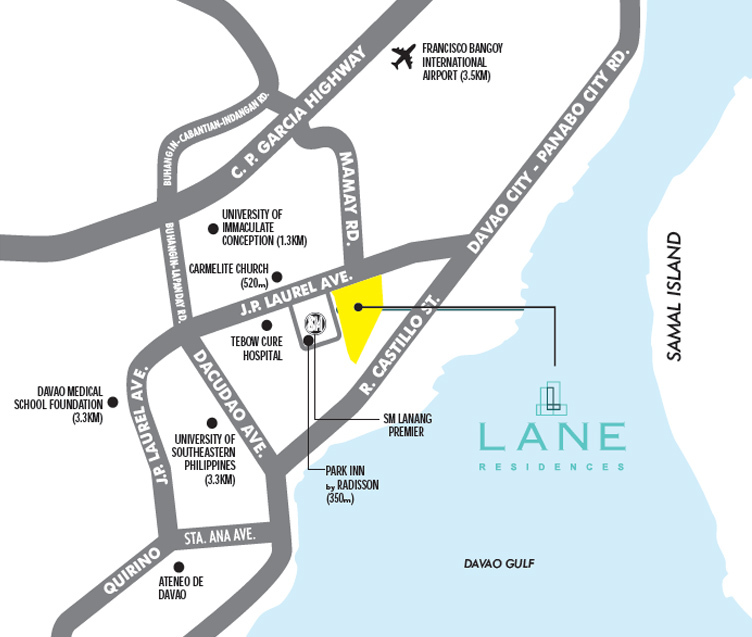 Located within the SM Lanang Premier complex, everything is within reach at Lane Residences. Its close proximity to the Francisco Bangoy International Airport as well as the seaport gives residents an added level of convenience as they get easy access to major land, sea, and air transportation centers. Rounding out the area are the many businesses and offices for enterprising individuals. With SM Lanang Premier right beside the property, residents get a wealth of shopping, entertainment, and dining options waiting to be discovered. All of these come together to bring a new kind of lifestyle that combines excitement with a relaxing, laid-back vibe — all within the city. Lane Residences is designed with lush greenery and multiple open spaces to create a calming atmosphere that is perfect for leisure. Residents can have a picnic, play with family at the playground, take a stroll, play basketball, or simply lounge at the clubhouse. A warm welcome awaits residents when they enter any of Lane Residences’ wondrous lobbies where the simple yet elegant ambience is sure to be a delight for everyone. Homes can also be designed to the heart’s content with flexi units that offer freedom to combine units, allocate rooms, and maximize space. Lane Residences’ property management team is readily available to assist clients and address any concern. They are constantly hard at work to ensure that the complex, units, and amenities are safe and well-kept. This way, the property stays a good investment for years to come. The team is also on hand to help owners lease out their property if they desire to start getting returns for their investment. In addition, 24-hour security team and doorman services are always on duty for the residents’ safety and convenience. To learn more, click SMDC Lane Residences.